Nearly 75 years ago, on July 4, 1939, Lou Gehrig stood on the field at Yankee Stadium and announced to the world that "today I consider myself the luckiest man on the face of this earth." While he lost his life to ALS two years later and since that time ALS has become known as Lou Gehrig's Disease, the Northern New England Chapter of The ALS Association continues his brave fight to find a cause and treatment for ALS. On May 20, the Portland Sea Dogs will pay tribute to Lou Gehrig and those who are living with ALS today in partnership with the Northern New England Chapter. 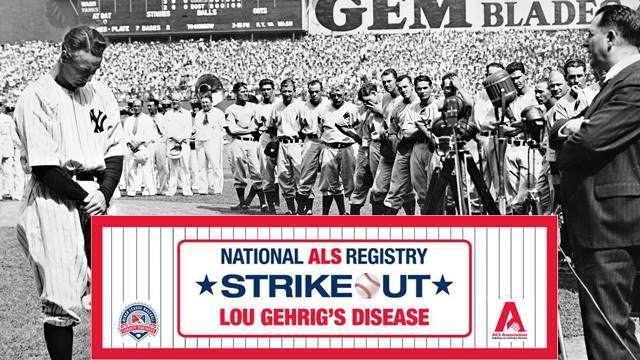 Join them as they help raise awareness of Lou Gehrig's Disease and the National ALS Registry, a research project that may help scientists find the cause, treatment and cure for the disease, which is fatal in an average of just two to five years. The first 500 fans entering the ballpark will receive camouflage colored ALS Registry foam baseballs. On game day, the Sea Dogs also will honor the 75th anniversary of Lou Gehrig's famous speech with a number of activities as we aim to Strike Out Lou Gehrig's Disease. Come out to the game and join us in supporting those battling Lou Gehrig's Disease. Tickets are available for all Sea Dogs home games. Tickets can be purchased by calling the Sea Dogs ticket office at 207-879-9500 or online at www.seadogs.com.